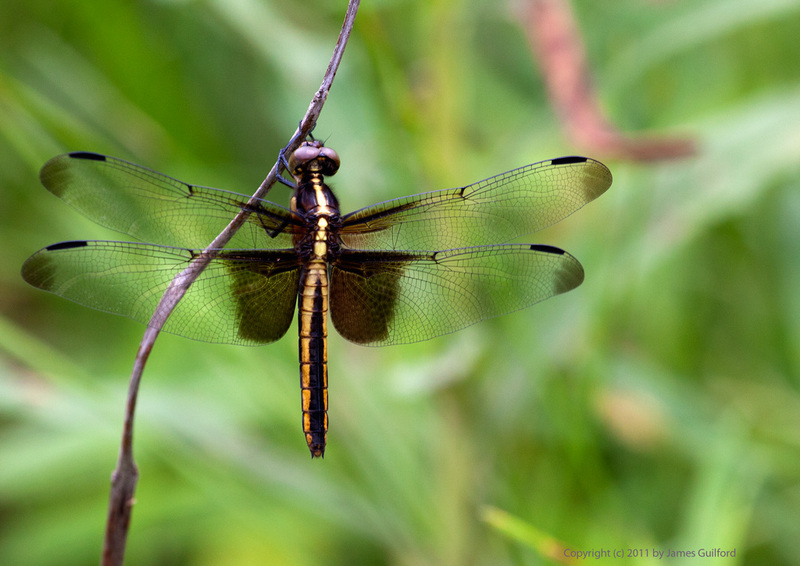 Dragonfly "Widow Skimmer" (Libellula luctuosa) female pauses on a twig. We sought out and found a couple of natural places, away from the day’s noisy festivities. We had quiet strolls in woods, fields, and around ponds and wetlands. We saw the denizens of those places: herons, white-tail deer, frogs, fish, and dragonflies. It’s turning out to be another “dragonfly summer” for me and I like that. One of the best photos of the day was a beautiful black and golden female Widow Skimmer spotted in a small township nature preserve. ← Oh, it’s so good to be home! I love your dragonfly photos. No such lovely creatures in my backyard. Thanks! I’ve really developed a love of photographing those little beauties and learning their names. It surprises me sometimes where we see them — even in busy suburban areas — telling me they’re very adaptable!